Other than being wrong on every major American foreign policy and national security issue over the past four decades, Joe Biden would make a great President. Former Secretary of Defense Robert Gates speaks his mind with regards to Vice President Joe Biden and slams the VP for his record on American foreign policy and national security issues. In excerpts from Gate’s book, “Duty: Memoirs of a Secretary at War,” attained by the NY Times, Gates calls Mr. Biden “a man of integrity,” but questions his judgment. Hmm, who doesn’t? You mean like when Biden was against the surge in Iraq? Barack Obama has always passed off Biden as some type of foreign policy guru. Well, I guess if you compare him to Obama, he is. However, Robert Gates seems to have quite a different opinion. As stated at the WAPO, Bob Woodward writes, Gates also accuses Biden of “poisoning the well” between the administration and military leaders. Not only has Biden got foreign policy and national security issues wrong, he got Virginia and North Carolina wrong as well. Former Secretary of Defense Robert Gates has harsh words for Vice President Joe Biden’s foreign policy judgement in his soon-to-be-released memoir. According to the New York Times, which obtained an early copy of the memoir, Gates calls Biden “a man of integrity,” but questions his record. “I think he has been wrong on nearly every major foreign policy and national security issue over the past four decades,” Gates writes, according to the Times. Gates, the only high-level holdover from the Bush administration to the President Barack Obama’s Cabinet, reveals he nearly quit his post in September 2009 while Obama reviewed his Afghanistan strategy. Who Thinks that the Biden-Obama foreign policy was a success? Why would some one commit troops to a mission that one did not believe in? This is enormously troubling. Was it merely political? 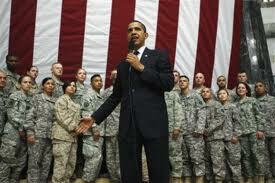 Barack Obama: Commander in Chief or President Photo-Op? More damning excepts at Doug Ross.